WIZARDS® Products is setting a new standard in detailing clay and surface restoration with the introduction of Mystic Clay™ (Part #10023). Mystic Clay™ quickly and easily removes tree sap, industrial fallout, rail or brake dust, and other contaminants that make your vehicle’s surface feel rough. It is also excellent for removing fresh overspray without harsh solvents or rubbing compound – saving you hours of time and the cost of professional buffing. 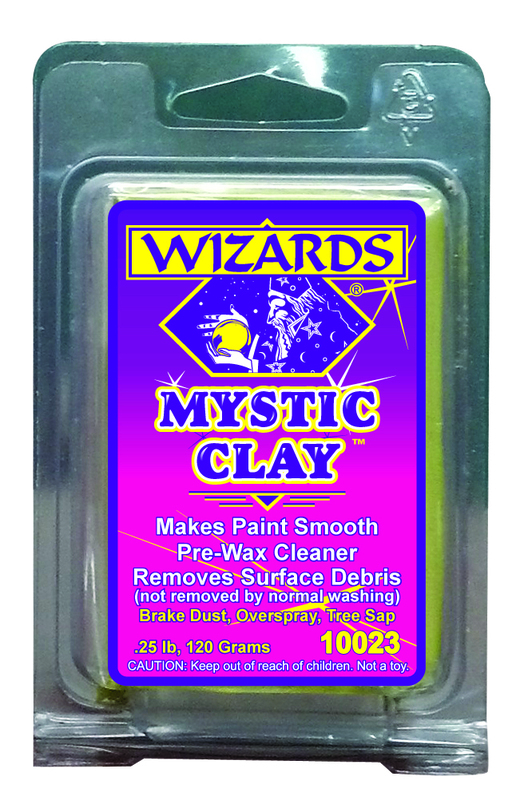 Mystic Clay™ is safe for all paint/clears, glass, fiberglass, metal or any hard surface. Use Mystic Clay™ in conjunction with WIZARDS® highly regarded Mist-N-Shine® Professional Detailer (Part # 01214) to deliver the best gloss and extremely smooth finish without scratching. 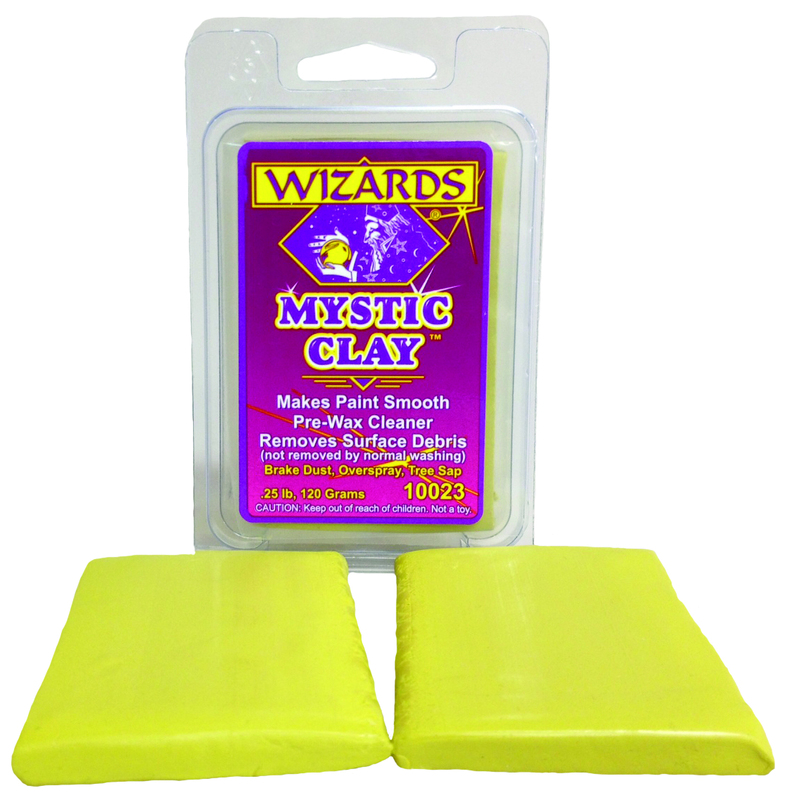 Mystic Clay™ is proudly made in the USA and is available for immediate sale in a 2 bar (120 gram) package. For more information about Mystic Clay™ or WIZARDS® Products complete line of professional detailing and finishing products visit WizardsProducts.com or call 800-356-7223.
RJ Star Inc. / WIZARDS, manufacturer and exclusive distributor for WIZARDS® Products, offers a complete, professional line of appearance care items designed to clean, shine and protect all surfaces of the vehicle. WIZARDS® products include Mystic Spray Wax™ Slick Finish Spray Wax, Mist-N-Shine®Professional Detailer, Shine Master™ Polish and Breathable Sealant, Mystic Cut™ Nano-Sphere Technology Compound, Turbo Cut™ and Finish Cut™ Buffing Compounds, Crystal Clear™ Plastic Cleaner & Polish, Bug Release™ All Surface Bug Remover, Power Clean™All Purpose Cleaner, Supreme Seal™ Paint Sealant, Metal Polishes, Metal Sealer, Mini and Metal Buff Kits and Multi-Fiber™ Cloths.